The first V-8 powered Corvair was most probably the '60 model four speed coupe of Bob Sottas from New Jersey with a 283 Chris Craft small block with reverse rotation in the original Corvair engine location. But by far, the most popular and best known is the CROWN Conversion kit using the late model Corvair coupe with its four wheel independent suspension and stuffing a small block Chevy into the back seat just behind the driver. CROWN was the brainchild of owner, builder, driver and engineer Ted Trevor who began building high quality castings in his California shop around 1957. They were into the off road scene way before it became what it is today, building bullet proof accessories for the popular Volkswagen dune buggies. They pioneered the first Corvair to Volkswagen adapters and many more high performance parts and pieces for both. The four spider differential gear modification was first done on a VW transaxle known as the "Beef-a-diff" and later performed on the Corvair differential for the V-8 conversions. In the mid sixties Ted partnered up with Don Wilcox for a Corvair powered Volkswagen dune buggy that dominated the Southern California hot bed of auto-crossing to the tune of 25 out of 26 fastest times of the day. Don still owns that buggy. Ted also ran a Vair buggy in the 1966 Pikes Peak Hill Climb and won the under 3 liter class. Somewhere around 1967, Ted and company saw the potential of mating the power of the lightweight small block Chevy engine to the late model Corvair and the Corv-8 kit was born. The whole idea behind the Corv-8 was for the average Joe backyard mechanic to be able to build a street legal "sleeper" with Group 7 handling and performance for an affordable price - in one weekend. The ads used to say "For $1000 and 40 hours work you can have one!" Your mileage may vary. Mine certainly did! ultimately went out of business, but Clark's Corvair Parts, Inc. acquired the rights and many have been built since then along the same lines. Trevor himself still owns at least one Corv-8 and in the 1990s and early 2000s made occasional appearances at Corvair shows. These days Ted is enjoying his "golden years" in a assisted living center in the Northeast. The Crown Corvair is still a remarkable car. Ron Hill's styling team at Chevy made the second-generation Corvair as pure and lovely as anything Italy's Pininfarina ever designed and the Crown conversion gives it an unusual blend of sports car handling and American hot rod muscle. A pur sang thoroughbred it is not, but at least when competently assembled, it's hard to argue with the results. I will miss being able to just call him up to chat about the car history and to see how he was doing. My Conversion story started in 1993 and I met Ted a few years later. The paperwork showed that it was a Crown car and owned by Mrs Trevor. I found Ted to be easy to talk to about this car and anything else that interested us. Eventually he came out to visit family in LA and we found time to get together and so he came out to the house in Newbury Park, Ca. to see the car. At this time he was already in his 70's and still involved in his hobbies. We went for a drive out in the country and after a while I pulled over and offered for him to drive and he said that he had not driven a v8 vair for about 20 years and would love to. We changed sides and he fired it up and crammed it into first and punched it. We were about 100 yards from a long sweeping left and as he pulled into second and yelled ''watch this'' and I started getting nervous as he swept around the corner in a perfect 4 wheel drift and pushed on into third and fourth. He eventually slowed down a bit and laughed said '' I remember this''. We drove and talked and it was a fine meeting. Six months later he called me and said he just went for a ride in #1. When he got home he found #1 at a family members barn and brought it home and got it going and was pleased to have reconnected with that part of his life. He became more involved with the v8 registry and made many new friends and went to v8 Corvair meetings whenever he could. The car was a family member for me these many years and with the history made for good car show conversation. Thank you for letting me watch over this wonderful part of automotive art. You will be missed. 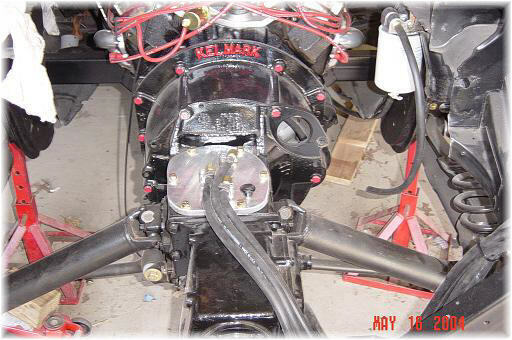 Kelmark is a conjunction of Keller and Markham, the two engineers who invented this setup. Their approach to the Conversion mounted the engine 11 inches further back in the car than the Crown Conversion. This allowed for the retention of the stock front seats, turning the trans-axle 180 degrees flat to the rear end and connecting it to the engine with a bellhousing adapter. Mid-engineering was formed by a select group of automotive engineers and builders. They designed a number of kits to convert various vehicles to a mid engine configuration. The most important one to us was the kit to install an Oldsmobile Toronado (or Cadillac) front wheel drive train and engine into a late model Corvair which became known as a Toro conversion. Picture a 455, W30 Olds in the back of your Corvair! Russ Brandenburg started the V-8 Registry in 1993 because he needed input, sympathy and more knowledge about Conversions and what he could do for his car. Today, there are many members in North America and Europe. Happy New Year 2011 (better late than never, though better never late) – After 17 years Russ Brandenburg has decided to step down as president of the V8 registry and has passed the torch to me, Archibald Evans. It was Russ’ notion to start a club for Crown V8 Corvairs to assist those searching for parts and solutions to build, restore, buy and sell CorV8’s through net-working. I remember the conversation Russ and I had wherein he first asked of my thoughts about forming a registry for the mid-engine V8 Corvair. It seems as if it were only a mere decade and a half ago... There was no U-Tube, no Facebook, and no My Space then. Nowhere to boast or glean information regarding Ted Trevor’s brilliant homogenization of a small-block Chevrolet V8 engine stuffed into in the back seat of a late model Corvair a car Road & Track magazine deemed a “Street-Legal Group7 race car”. For those of you who install V6’s, V8’s or V12’s or what have you in the trunk or the engine compartment Russ welcomed you too. The V8 registry is a place for individuals who’re passionate about extremely modified Corvairs far beyond maximizing the performance capabilities of the Chevrolet Corvair engine. On the 26th of November 2010 Russ Brandenburg drove down from Pismo to Redondo Beach California, a 3 hour one way trip, to have lunch with the Westcoast Waterpumpers chapter of the V8 Registry and to hand over the baton. Russ and his wife Deb had flown out from Ohio to have Thanksgiving with their daughter who’s been living and working in Pismo Beach California. At the Waterpumper luncheon in attendance were: Steve Elliot and his son Josh (who’s one of our nation’s defenders in the US Air Force), Chuck Rust (former Air Force), Greg Vargas, Hector and Ralph Gonzalez, Russ Brandenburg, Jim Hart, Dave Shaver and his son Ian, Dan Powers and yours truly. The Westcoast Waterpumpers are a lively and diverse group. We told tall tales, laughed and bench-raced all afternoon. How thrilling it was to cruise down Pacific Coast Highway within a thundering pack of mid-engine V8 Corvairs. Chuck, Dan and Dave drove their Corvairs. Chuck drives a ’65 4spd 283cui. original Crown V8 Corvair, Dan drives a ’65 215 cu in mid-engine V8 Kelmark Corvair with Nitrous (the finest Kelmark Corvair this author has ever seen) and Dave drove his ’63 Monza 4spd screaming beater even though he has a ’65 CorV8 with a 365hp 327cu in Corvette engine in it. Hector left his ’66 350 cu in convertible CorV8 at home as did Jim all with good reason, neither is running as of this writing, nor is Steve Elliot’s 450hp+ 355cui. small block ’65 convertible 4spd Corsa CorV8 as it’s under construction. Russ drove the SuperVair/R prototype and he drove it like he stole it which tickled the owner. I believe that the V8 Corvair has yet to see its zenith and deserves much over due recognition. The hot-rodding community will only take notice if the cars are available to be seen. Years ago we had a member by the name of Michael Hawks who took the Denver area by storm. Michael drove his yellow late model 406cui. small block automatic Crown Corvair to shows and to the track. He was passionate about V8 Corvairs and infected others with his enthusiasm and the desire and challenge to build CorV8’s. We unfortunately lost Michael at too young an age but his memory and passion live on with those of us who remember him. It’s up to each of us, individually and collectively to make something more of the V8 registry. So take your CorV8, Kelmark or custom-built V8 Corvair to the local show, the SCCA vintage event, the auto-cross or track day to be seen and have fun. Fret not brothers you can legitimately race your V8 Corvair. 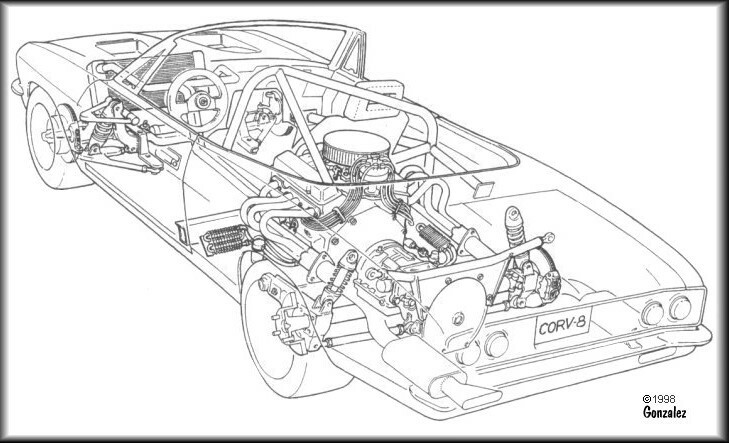 CorV8’s have a 44 year documented racing history. Many of you may not be aware that a small block CorV8 raced in the ’68-’69 CanAm series making it to 7th in the national standings before a crash ended its carrier late in that season. The ’67 Winter Nationals was won by a front-engine Corvair funny-car. Our own Mike Levine raced a Big Block CorV8 with David Macintosh in the mid-‘70’s and still races his 383 CorV8 in vintage SCCA. Levine and Macintosh started their first SCCA race circa mid-‘70’s 14th due to qualifying issues, a McLaren held the pole. Not only did Macintosh and Levine finish the race, not only did they finish first in class but they finished first over all! Take your V8, V6 or V12 Corvair to cruise nights no matter in what stage of completion your car may be. A “raw” V8 Corvair will often receive more attention than a finished car because the mechanics are more easily viewed. The SuperVair/R prototype won the George Barris Muscle Car award in 2008 painted only in yellow acid/epoxy primer with an incomplete interior. Of the nearly 20 cars that received awards from George Barris that year the SuperVair/R prototype was the only car unfinished in primer. I have known for quite sometime Russ was considering giving up the helm to the V8 registry. Russ did not cajole or coerce me into taking the reins, to the contrary he planted a seed and cultivated it with encouragement over a long period of time. I am honored to pick-up where Russ has left off. I can only hope that I will be able to fill Russ’ large shoes and successfully move the V8 registry into the future. I can not do this alone. Any successful club or organization is comprised of it's members and is the sum total of its parts. I will need your participation and input for the V8 registry to flourish. I want to hear from each and everyone of you. Share your V8 Corvair build stories and antidotes with me so I can share your stories via the V8 registry - don’t forget to send good detailed pictures. Tell me what it is that you’d like to see and what changes you think will improve the V8 registry and the registry newsletter, I’m open to suggestions and constructive criticism. I challenge all of you to participate with me in expanding the V8 registry and raising the exposure of the most quintessential of pro-touring muscles cars the V8 Corvair to the rest of the hot-rodding community. Keep the rubber on the road. President of the V8 Registry." The Annual Meeting of the V-8 Registry was held during the CORSA Convention in Kalamazoo, MI on Thursday, July 18, 2013. The meeting was called to order by the Acting Chairman John Lanning to a room filled with interested attendees. The chairman introduced himself and explained that he volunteered to be the point person for this year’s Registry meeting after which CORSA and the Host Committee agreed to schedule a meeting location. Past members were notified by email of the scheduled meeting during the convention. With no CORSA officers or Board members to introduce, Chairman Lanning went on to report that since there was no meeting at the last convention in Sturbridge, MA, there were no meeting minutes to read. No Treasury Report was given because the bank account had been closed after the remaining funds had been spent, per information reported by the Past President, Archibald Evans. Checks received for membership dues were not deposited or returned and were destroyed. OLD BUSINESS - The Chairman reported that Archibald Evans had contracted Lyme Disease in 2011 and that due to medical complications and resulting disabilities, he could no longer continue as President. Sometime before resigning, Archibald had employed the services of Adam Silver from Silver Lining Productions to host and rebuild the Registry's website. Arch became ill before the work was completed and Mr. Silver advised that he was stopping work on the project until he received $400.00 for his services to that point. The total cost to rebuild the site was estimated at $1500.00. At that time Mr. Silver took over ownership of the domain V8VAIRS.COM and was unwilling to release it until he was paid. An annual fee of $100.00 for hosting the site was also added annually to the fees already incurred per Archibald. NEW BUSINESS - In response to the meeting notification, several past members volunteered their services. Paul Beck volunteered to serve as Secretary/Treasurer. Mr. Beck is already updating the Group Roster and making inquiries with a bank regarding a checking account. Russ Brandenburg placed Mr. Beck’s name in nomination and he was unanimously elected as Treasurer. Rick Andersen volunteered to serve as Vice-President and Webmaster. Rick has already reviewed the content on the website and indicates that he can rebuild it at no expense. Paul McCreery placed Mr. Andersen’s name in nomination and he was unanimously elected. John Lanning offered to chair the Group for the next year. Spence Duffy nominated Mr. Lanning as President and he was unanimously elected by those in attendance. Rick Andersen had previously suggested that a Forum style website be considered to allow members to communicate with each other and to post information about their cars. This idea was well received by the attendees. There was consensus from the group that we reimburse Adam Silver for his services as soon as funds are available. Members were asked to fill out membership forms before leaving. Nineteen forms were returned. With no further business to conduct, the meeting was adjourned and members gathered with their cars on the grassy knoll near the hotel front parking lot. The muscle car hobby in recent years has become obsessed with making sure every nut, bolt, and decal of a car is exactly the way it was when it left the assembly line. That fetish for numbers-matching authenticity, however, runs counter to the hot-rodder ethos that spawned the muscle cars in the first place -- a can-do spirit that didn't hesitate to try anything that promised a little more speed. In that light, there's something deeply refreshing about the kind of madness that would lead a man to stuff a V8 engine into the back seat of a perfectly good Corvair.